If you’re looking for a respite from the news that Earth now has a real life picture of a supermassive black hole, you’ve come to the right place. Here’s some other news to peruse this week (but here’s a video on black holes too if you are interested). 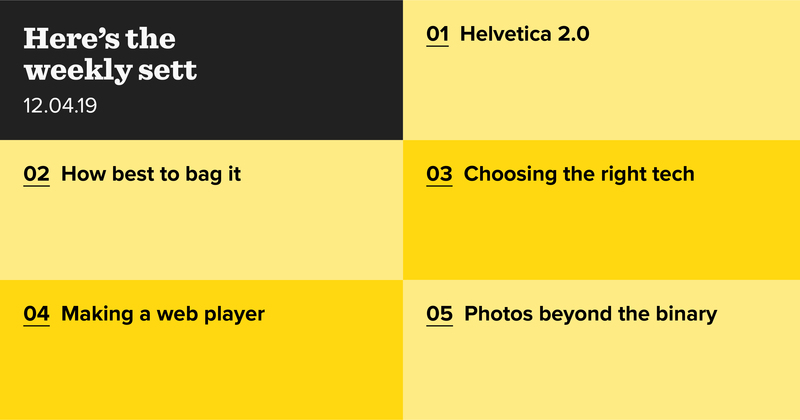 Helvetica is perhaps one of the most recognisable fonts, used across logos, government websites and homework assignments. However, there’s a new font on the block. Helvetica Now is the revamped version, which saw Monotype redraw every single one of Helvectiva’s nearly 40,000 characters. You can check out the new font and learn more about it from Monotype’s type director, over at The Verge. eCommerce sites can’t decide what to call their basket, or their carts, or their bags. UX Collective notes that there is no golden rule for naming this page, but also highlights that while eCommerce sites may not even need such a page, its importance to a user means that it must be included. As such it argues that sites need to choose the page name wisely as it needs to strike a balance between reassuring users and pushing them, gently, towards purchase. Choosing the right tools for the job can be hard. Many like to devote hours to pouring over blogs and comments online, some make a snap decision and run with it, while others use tech such as MapReduce to help make decisions easier. However, Brad Fields argues that you should not use this tech to make these decisions. He notes that just because big companies like Google use them, it doesn't mean you should too. Instead, he suggests methods like UNPHAT to help you stop and think about the right tools for the right problem. Spotify has released the tale of its web player for desktop browsers. The story outlines the tech used to shift the music platform into a new channel, creating a new user experience in 2012, and then how the web player was revamped in 2016 taking inspiration from Spotify for TV and video consoles. Stock images are meant to reflect the ordinary world and, as such, their lack of diversity is alarming. To combat this, Broadly have created new stock photos that show the ordinary worlds of those outside the binary gender spectrum, adding more diverse images to the stock photo hall of fame including the woman laughing alone with her salad and a guy walking down the street with his girlfriend.